Fred Minnick is a former Army photographer, an experience that led to his first book Camera Boy. In 2012, Minnick was named a finalist to the Pink Lady International Food Photographer of the Year. His stock food photography can be found on Photoshelter, Getty Images, iStockPhotos and Alamy. He considers all photography jobs, but turns many down. Feel free to contact him regarding a possible photoshoot. This French raspberry tart appears in the Junior League of Louisville cookbook. 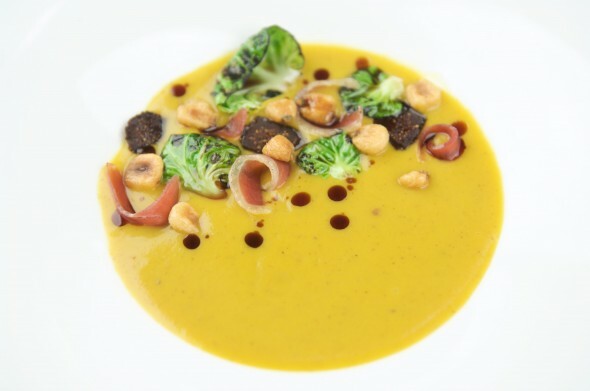 Butternut Squash Soup with Mission Figs, Newsome’s Ham, Fried Hominy, Brussel Sprouts & Pumpkinseed Oil. Made by chef Edward Lee, owner of Louisville’s 610 Magnolia and winner of the Iron Chef competition in 2010 and Bravo TV’s Top Chef finalist. Joseph Zuccardi, a winemaker in Mendoza, Argentina. The Bodega Familia Zuccardi is a popular vineyard and grows more than 40 varieties of grapes and makes olive oil and grappa.